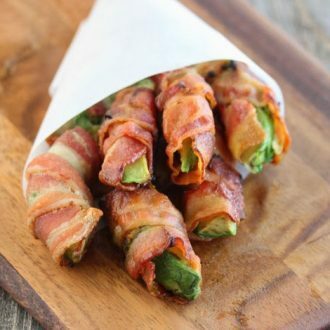 The other day, reader Ed left me a comment, pointing me to a recipe post for bacon wrapped sweet potato fries and asked me to do one with avocados. The fries looked amazing. And I love the idea of mixing the sweet and the salty. I might use them as a Thanksgiving side dish instead of the traditional roasted sweet potatoes. 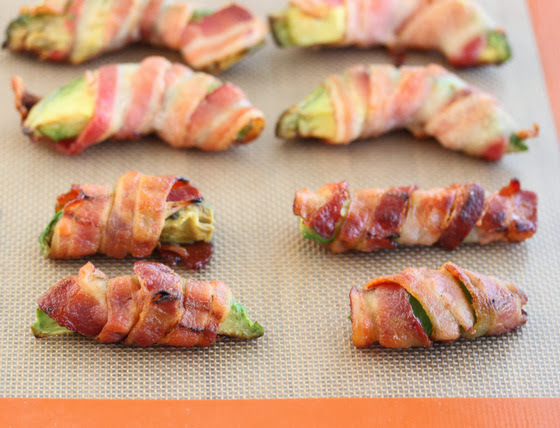 But first, I experimented with trying bacon wrapped avocado fries. The tricky thing with avocados is that you don’t want to heat them up too long or they turn quite bitter. My first attempt, I used raw bacon. The raw regular slices (don’t use thick cut) wrapped and stretched around the avocado slices perfectly. Unfortunately it took more than 20 minutes to get the bacon very crisp, which is the way I like my bacon. This caused the avocado to be quite bitter. So I tried again, this time with the precooked bacon strips you can purchase at Costco. Because they are precooked, they don’t stretch as easily, but the strips are not cooked until crisp so they do have some stretch left in them. I was able to carefully wrap them around the avocado slices. I just had to make the avocado fries shorter and thinner. I only needed to bake them for 5-10 minutes before the bacon was ready. 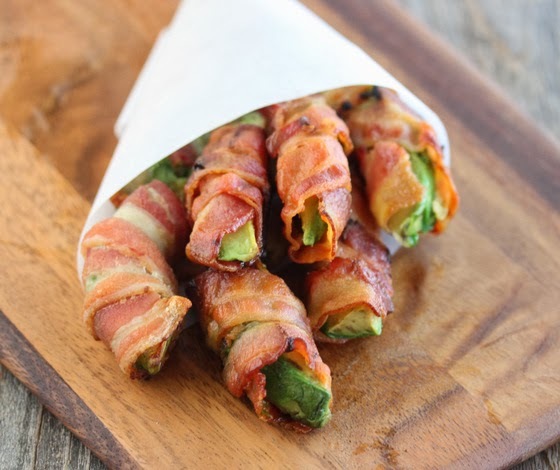 These bacon wrapped avocado fries make a really fun appetizer. I definitely plan on making them for a party in the future. 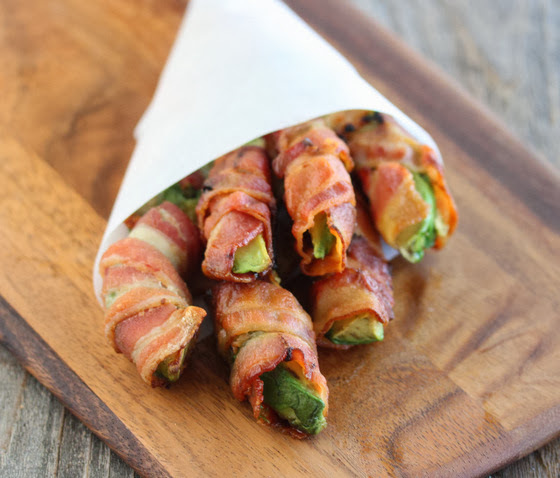 If you love bacon and avocado you will love these bacon-wrapped avocado fries! They are perfect for parties. Preheat oven to 425°F. Take one strip of precooked bacon and try to gently stretch a little longer without it breaking (especially near the lighter pink and white parts). Carefully wrap around avocado fry, starting at one end and working to the other end, and securely tuck in the end piece. Repeat with remaining and place onto baking sheet. 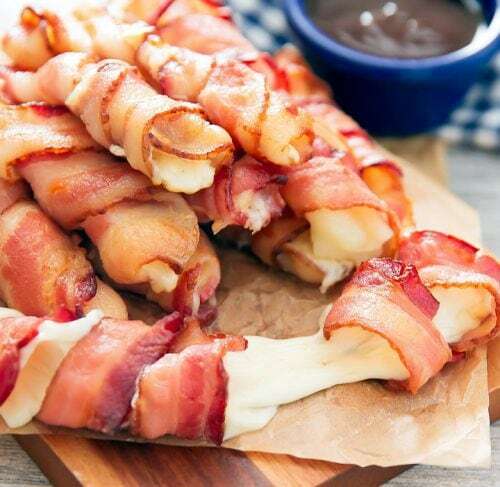 Bake for 5-10 minutes or until bacon becomes crisp. It's important to use precooked bacon instead of raw. If the avocado cooks too long in the oven it becomes very bitter. 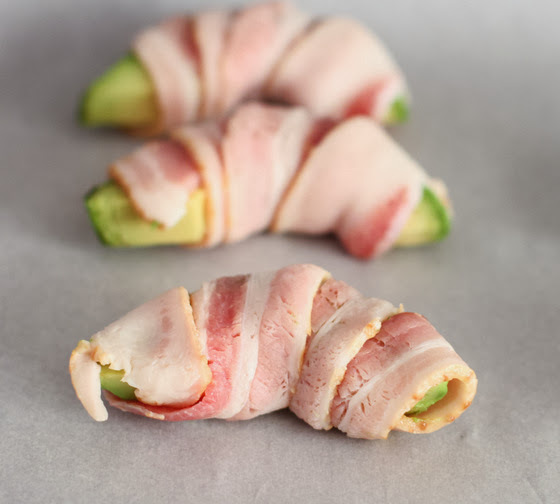 Using precooked bacon cuts the cook time down so that the bacon is crispy, but the avocado is still delicious when it comes out of the oven. I buy packages of precooked bacon at Costco or you could pre-cook your own. If you use raw bacon, cook it about half the time you normally would. It should be flexible enough to wrap around the avocado. I agree, bacon makes everything better and the avocado looks so pretty with the bright green popping out. Omg. These look so good! And low carb! Yes! The 2nd to last pic you have – is that the raw bacon or the pre cooked bacon? That was the raw version. Sorry I don’t know why I forgot to take a photo with the precooked bacon. Hey that’s an excellent addition you made there to the already delicious fries! Well done! I wonder if you zapped it in the microwave for about 5-10 seconds if they would loosen up a bit and be a little easier to wrap? 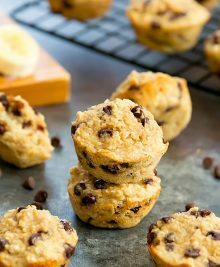 Def going to try these, looks so yummy!!! You mean the precooked bacon? I think if you zap it in the microwave it will only cook it more and make it more crispy. Just found this via buzzfeed. Glad to see a great San Diego food blog! I’ve been craving fries since going low carb, definitely need to give these a try! I bet a dipping sauce would be great…maybe salsa or perhaps ranch? that is an option, but I really wanted a bacon and avocado combination. These look amazing! 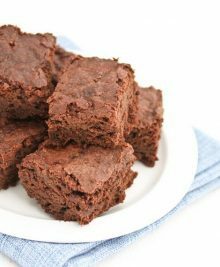 Making them right now because it’s Friday and why not. You are a genius. mmm, sounds great for a Friday night! Hey…look at Mom’s Got Ink on FB. She stole your photos from this post and didn’t give any credit or links. She does this daily to lots of people. one of the things that angers me most is seeing my photos stolen. Thank you for informing me. These look amazing! 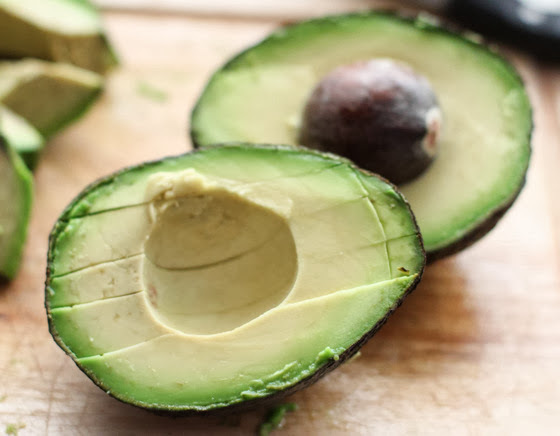 My problem with avocados is that when I buy them and they are ripe and ready to go, I can’t eat the whole avocado in time before it turns brown! 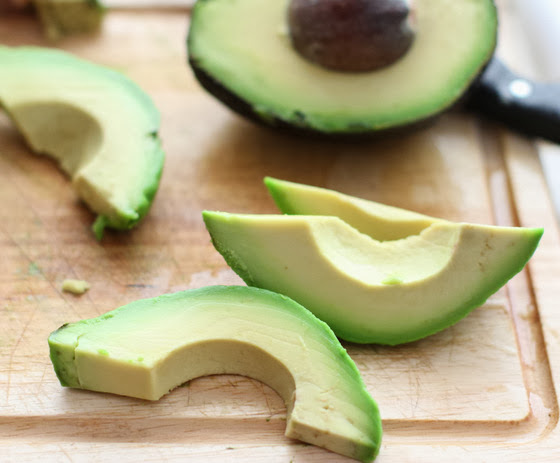 Do you think that by wrapping the avocado in bacon and then baking, the avocado will have more time before turning brown? I love avocados but have given up on buying because I end up wasting so much because of how quick they turn brown and I end up wasting my money.. I don’t think this will help preserve them longer, but it should help you eat them faster! no, make sure you remove the skin! These look amazing! Do you think turkey bacon would work as well? I love cooked avocado! And bacon is pretty much my favorite thing in the world. I can’t believe I never thought to put them together! Thanks! I’ll have to give it a try! thanks! Congratulations for making the Buzzfeed post! How do you get the avocado not to go bitter? I’ve tried cooking avocado and it always comes out so bitter. I find avocado gets bitter if it’s cooked too long. If it’s just a few minutes it should be fine and the bacon helps cover any slight bitterness. How about a creamy Sriracha Ranch for dipping! I use Serrano ham to wrap around asparagus and grill. So I thought I’d try Doing the same with the advocado. I’m in Spain) will also use olive oil a D black pepper. Thank you for the inspiration! What would happen if I just used uncooked bacon? Should you serve this hot? I want to take to a party and some times it is difficult to serve hot appetizers. Would room temperature work? Room temp should be fine! I eat them that way all the time. As long as they don’t get to the point where the grease congeals. I can not wait to fix these for our Daughter/Mother movie night this week. I love a lot of your creations, can’t wait to see more. 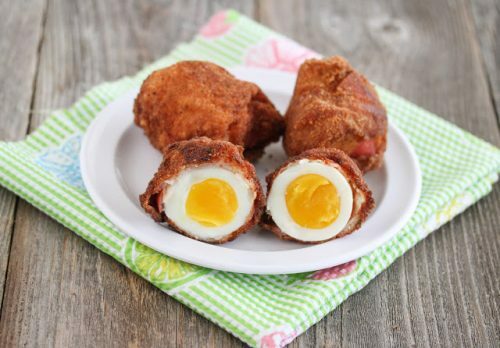 Why not fry them in lard? 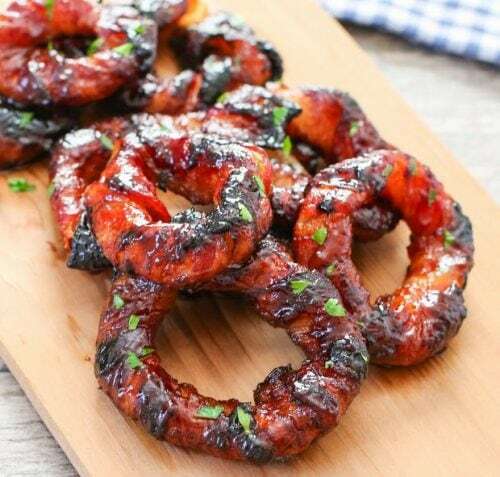 Deep fried bacon is perfect in under 5 minutes. you can do that too. I was trying to do a baked version. Hello. I think I have a solution to the gross precooked bacon conundrum. 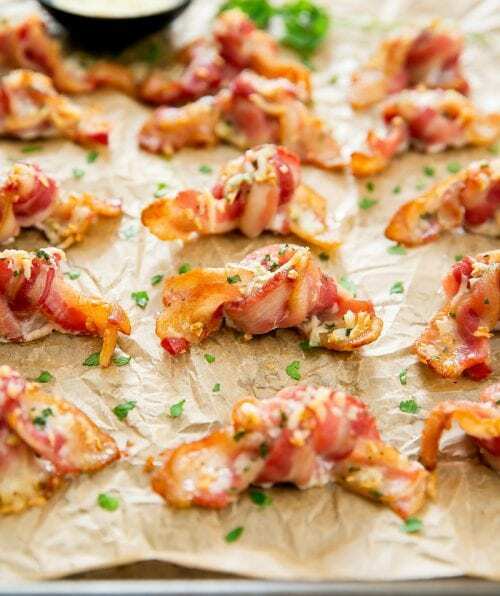 My stepfather used to make bacon wrapped oysters and scallops (which obviously would stand up better than avocado in the oven) but there was so much bacon fat and grease splattering around in the oven it was often quite a mess…but oh so worth it. What he used to do was slice each piece of bacon into two and low cook it to render out a lot of the fat but not so much as to make it hard to wrap. Then popped it under the grill and it always turned out lovely and less mess. It’s Christmas Eve and I’m going to try this method.. Thought I’d put this out there and I’m hoping it will work.